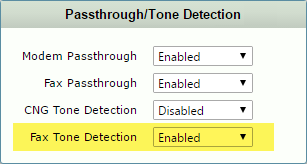 Sonus introduced “Fax Tone Detection” in the SBC 1k/2k v6.1.1 b459, but it has a glitch in it: turn it off and you’ll get 1-way voice. Specifies whether or not the Sonus SBC 1000/2000 system will detect Fax tones produced by the terminating side fax machine. Fax tone detection(V.21 flags) is used when Fax calls are received from TDM to a Fax server and the voice call needs to be switched to a Fax call using T.38. If Fax tone detection is enabled, the SBC Edge detects the Fax tone from TDM and switches to Fax mode (it will initiate a re-INVITE with T.38 support to the Fax Server). If Fax tone detection is disabled, the SBC Edge will pass-through the Fax tones to the Fax server and the Fax server will have to detect them and initiate a re-INVITE to switch to Fax mode with T.38. I’ve encountered this with ISDN to the carrier feeding SIP to SfB, and from a SIP carriage service to an ISDN PABX. The fix is to ensure Fax Tone Detection is set to Enabled on the Media List. The issue doesn’t manifest itself for SIP-SIP calls. The issue has been documented as SYM-23041 and is due to be fixed in a future release. Thanks Greig for the headsup! Great find and I must also add that we recently had issues with customers on hold failing for certain VVX phones once updated to this same version(6.1.1 b459). It was found that the default MOH payload size was 80 for the phones but sonus only supported values (20,40,60) Updating the config with these resolved the issue.